Protesters targeting Shell at a careers fair last year. Image: Fossil Free Warwick. A leaked document sent to corporations attending Warwick’s careers fair on Thursday warns the companies of “expected student campaigning” which is “likely to be focused around organisations active in or linked to the defence industry”. The document on “Security provision at Warwick events” – sent to the Warwick Globalist by an anonymous source – claims that Warwick’s “intelligence gathering” operations expect activists to target the arms industry this week. The document also warns of “an increasing level of student activism around tuition fees and campaigning for free education”, an apparent reference to the prominent group, Warwick For Free Education. The document specifically mentions the Business, Finance & Consultancy Fair, taking place this Thursday. Attendees include BAE Systems, the giant British weapons manufacturer accused of corruption and bolstering human rights-abusing regimes. BAE was the subject of protests at last year’s careers fair, and activists shut down a BAE Systems talk on careers in the company’s intelligence branch in November 2015. Warwick has deep connections with BAE Systems going back two decades. In 2007, Warwick Manufacturing Group issued a press release which “celebrated” 10 years of “togetherness” with BAE. Warwick promises in the document to “place employers which may be subject to student protest, close to exits which they can use if necessary”, although the University warns that it “can’t stop the unexpected happening”. Warwick also appears to praise protesters, arguing “that the energy, proactivity, and focus which students exhibit in organising protests, illustrate the skills and strengths which employers value”. What “intelligence gathering” Warwick has been undertaking is not specified. Peter Dunn, the University of Warwick’s spokesperson, said: “The ‘intelligence gathering’ refers to a single verbal question put by a member of the Careers team to a member of the Security team asking what they expected the level and type of protest to be at this event based on their past experience of these events.” However, an email from a member of Warwick’s security team seen by the Warwick Globalist says that Warwick’s “employer connect team” had alerted security about “protests at another uni’s [sic] (UCL) careers fair”, suggesting a more general social media surveillance operation, or cross-university information-sharing regarding protests. The University has a long history of student campaigning against the arms trade, most prominently during the heyday of an anti-militarist group, Weapons out of Warwick, from 2008-2012. The group was well-known for its actions targeting the defence industry at careers fairs. Activists have increasingly turned fire on the fossil fuel industry, most recently in October last year when Fossil Free Warwick protested Shell’s presence at a careers fair. 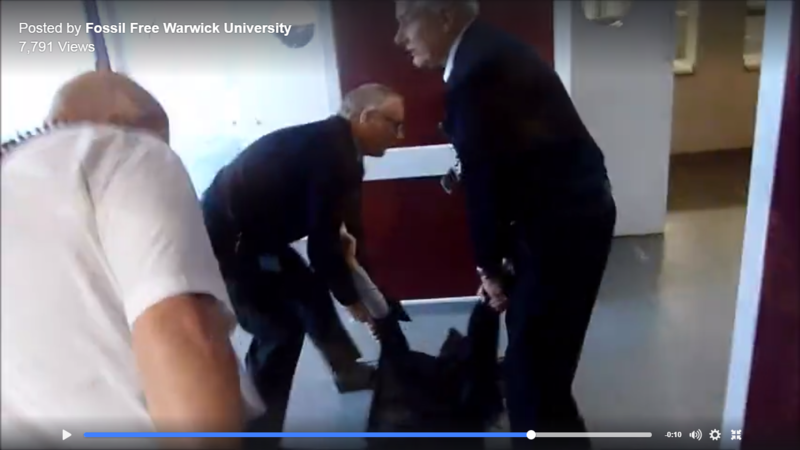 A still from a video of security officers forcibly removing an environmental protester from a careers fair in 2014. 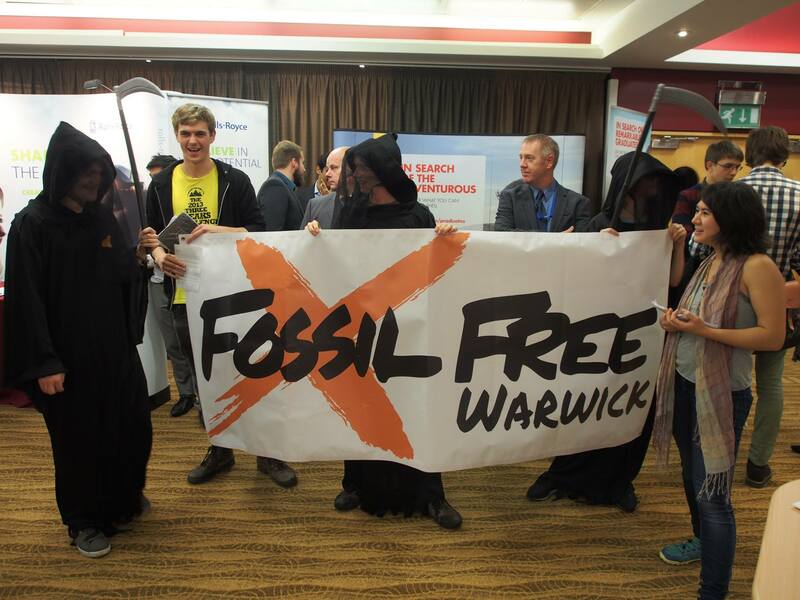 Warwick was criticised in 2014 for its heavy-handed response to a collection of environmental protesters who dressed up in grim reaper outfits and stood by the stall of British-Dutch oil giant, Shell. A video of a protester being forcibly removed from the fair and thrown to the floor garnered significant comment on social media. Shortly after this event, police were called to a Free Education sit-in at Senate House which ended in violent scenes. The widespread condemnation of the University’s handling of the protest led to a less hands-on security practice. The security code outlined in the document suggests a relaxation of Warwick’s policy since 2014. The document says that Warwick Security will be “maintaining [a] low security presence” and have a policy of “not intervening to stop or remove any campaigners”, in stark contrast to their actions in late 2014. In place of physical restraint, Warwick has increasingly turned to visual surveillance and social media monitoring, deploying plain-clothed guards on campus, fitting body cameras on security officers, and filming sit-ins. Earlier this year, Freedom of Information requests and requests under the 1998 Data Protection Act led to revelations that Warwick had been monitoring campaigners at Fossil Free Warwick as they launched a campaign against the presence of the BP Archive on campus.1 Warwick’s surveillance operations against politically active students stretch back to the late 1960s, when a huge student and staff uprising uncovered extensive evidence that Warwick’s management were monitoring activists and outspoken staff. The events became known as “The Files Affair” and were immortalised in E. P. Thompson’s 1970 book, Warwick University Ltd. This is not the first indication of surveillance activities by businesses and institutions linked to the arms trade. In the early 2000s, BAE Systems was found to have placed a hired spy inside Campaign Against Arms Trade, a national group which organises against the defence industry. Warwick For Free Education deny that they are planning any actions at the upcoming careers fair. It is not known if any other groups are planning disruption. Connor Woodman is the Warwick Globalist’s World of Warwick Editor and former Editor-in-Chief. He is in his fifth year at Warwick, currently undertaking an MA in Modern History. Do you have a story about Warwick University? Get in touch at cdwoo333@gmail.com.